Our projects yield a steady stream of jams, pickles, homemade pasta, bread and pizza, plus plenty of the sweet stuff—ice cream, granita, fruit crisps, pies and cakes. These months are when we navigate culinary backroads making fresh ricotta, posole and stuffed pupusas. I’m not sure we actually have more time on our hands (judging by the length of our project list), but a combination of no school plus long days that extend into what is known at other times of year as night, fuels our energy and enthusiasm. Paella falls squarely into this realm. It’s not that it’s a complicated dish. There’s no kneading involved and very little waiting. We do however, need to dig out our large, flat-bottomed skillet from under the heavy pile of more frequently-used pans. A trip to the store is next for rice, saffron and smoked paprika. None of this is particularly taxing, so why we’ve saved paella making for summer is not entirely clear. Perhaps it’s the fact that the dish feels special. Festive even. Take a pass by the simmering pot of vibrant colors with its sultry, smoked paprika aroma, and you’ll get my meaning. Tote the pan to the table, and spoon the steamy, vermillion rice into bowls with tangy lemon wedges on the side. The collective smile from diners will confirm what you already knew. Paella is an impressive dish. At the same time, it embodies the casual comfort of summer. Loose and flexible—it takes advantage of pantry and fridge stock. Paella’s place on our summer project list is less about complexity and more about taking time out to savor. Invite family and friends for an impromptu fiesta. Linger. This is what summer dining is all about. Paella requires a wee bit of planning. 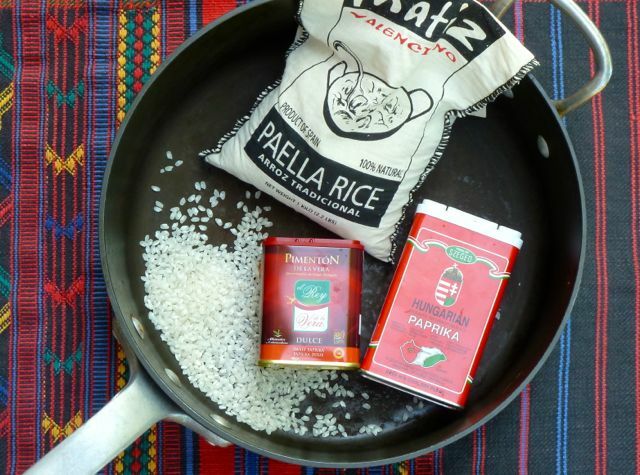 Make sure you have the following handy before you begin: a wide skillet or paella pan; paella rice (you may also see it labeled as Bomba or Calasparra rice); saffron; and smoked paprika. We don’t own a paella pan. The twelve-inch skillet I dig out is deep and wide, with straight sides. This heavy-bottomed vessel requires two hands to carry to the table, but simmers evenly on the stove in return. For the rice I head to Whole Foods where there are two types available, both from the rice capital of Spain—Valencia. I choose the less expensive bag, labelled simply “paella rice”, though I glance covetously at the twelve-dollar cloth sack of Bomba, which I am told is the queen of paella rice. Either way, you’ll take home a medium-grain variety—the cooked rice will have a slightly creamy texture, with kernels that remain pleasantly firm. Arborio (risotto rice) is a reasonable substitute. While you’re at Whole Foods grab a tin of smoked paprika (Pimentón de la Vera) and one of sweet paprika, if you don’t have it on hand (mine is Pride of Szeged brand, found at Safeway). Saffron is stocked at most any grocery store. You’ll pay dearly for a minuscule number of tiny crocus stigmas. If you have an Indian grocery nearby, buy saffron there. It’s likely to be less expensive, as are all the spices, so consider stocking up. 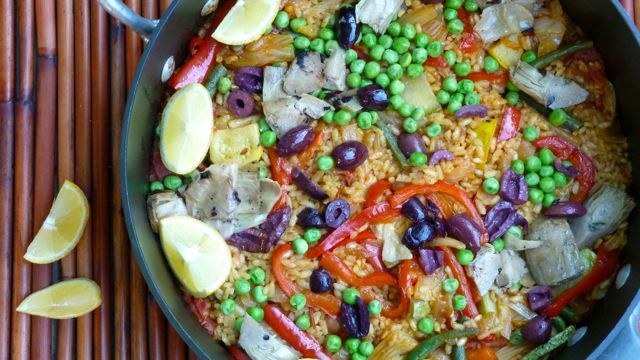 Paella is a flexible dish that welcomes nearly any substitution—a can of drained chickpeas or kidney beans, shelled fava beans, peppers of any sort, mushrooms, eggplant or chopped greens such as chard (add the chard stems, too). Consult your veggie delivery or fridge and go from there. You can incorporate shellfish, chicken or sausage, if you like—just cook ahead, and add back to the pan with the rice and broth. You’ll need a 13-inch paella pan or a deep 12-inch skillet. If you’re working with a smaller pan, reduce the amount of rice by one-half cup (broth by one cup), and the paprika and the overall amount of vegetables by roughly one-third. Substitute sweet paprika for the smoked if you must, but smoked paprika flavor is something worth the advance preparation—even a last minute grocery run. Buy a tin now, and tuck it in the spice cabinet. Ready for the next paella fiesta. Warm the pan (see headnote regarding pan size) over medium heat and add the oil. Cook the onions, peppers and fennel for about 10 minutes until they are soft. Add the garlic, bay leaves, both paprikas, saffron, zucchini, beans, tomatoes, a few grinds of pepper and one teaspoon salt (unless your stock contains salt, in which case, use a very small amount of salt, or none at all, and adjust salt to taste after paella has cooked). Cook for another 10 minutes. Stir in the rice and cook for 2 to 3 minutes, stirring occasionally. Add the warm stock, stir contents of the pan well and bring a boil. Reduce the heat to low and simmer very gently for about 20 minutes, until most of the liquid has been absorbed. Do not stir the rice while it simmers. Meanwhile cover peas (if using frozen) with warm water to thaw. Drain. 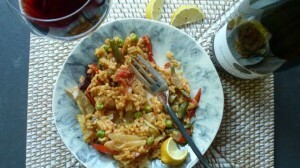 Turn the heat off the paella when it is done cooking and scatter the peas and artichokes over the rice. Cover with foil or a lid and let everything steam for 10 minutes. Remove lid and scatter olives and parsley over the rice. Taste and add more salt as necessary. Serve directly from the pan with lemon wedges. What could be better than a cool, green salad on a hot day? Dress the salad with a simple vinaigrette. Add slices of black amber plums, matchstick-cut radishes (for a little punch and crunch). Even a ripe creamy avocado. Or pungent goat cheese. When the weather cools down, fire up the oven and roast the zucchini (cut into cubes) in olive oil with salt and pepper. It’s just perfect as is, or pile into pasta, rice or cooked grains or on a toasty baguette slice. While the weather is hot, shave the raw zucchini with a vegetable peeler into long strips. Toss the squash with olive oil, sherry vinegar, garlic paste (garlic mashed with salt in a mortar and pestle), kalamata olive pieces, cubes of juicy summer tomatoes and fresh basil (or other fresh herbs). Sauté the chard with minced garlic, olive oil and white beans (rinsed and drained from a can). There is no better treatment to our minds. We sauté the chopped stems first since they need longer cooking (5-8 minutes), then add the leaves and garlic along with the beans for another 3 or so minutes (letting them brown a bit if you like). Finish with a splash of balsamic vinegar, lemon juice or sherry vinegar, salt and pepper. Add a crusty Italian loaf and green salad for a complete meal. This entry was posted in Journal, Recipes and tagged artichoke, bell pepper, gluten-free, green bean, pea, rice, tomato, vegan by Four Cooking Together. Bookmark the permalink.